On Sunday, March 7th, I attended Wilson 'Chembo' Corniel's CD release party, for "Portrait in Rhythms", at Satalla's. Chembo independently produced this recording, drawing from the diversity and experience of his music career. 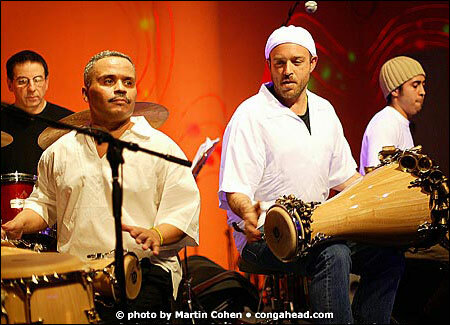 The performanace consisted of Chembo Corniel, Chris Theberge, Enrique Heniene, Ivan Renta, Carlo Derosa, Vince Cherico, Andrea Brachfield & David Gomez. Chembo was born in Manhattan on Nov. 22, 1953 into a Puerto Rican family. He grew up in Red Hook, Brooklyn, drawing from such talents as Tommy Lopez, Sr., "Little Ray" Romero and Cachete Maldonado. Chembo attended both The Harbor Conservatory for the Performing Arts in NY and La Escuela Nacional de Arte in Havana, Cuba. Here he sharpened his skills, helping him develop a reputation of his own. To learn more about Chembo & his new album, visit his website at ChemboCorniel.com.